AFC - 10/01/11 Chew the Veggie Challenge! 02/08/11 Campaign ''I Love Animals'' Goes On! 02/05/11 Fur is Stone Age Fashion! 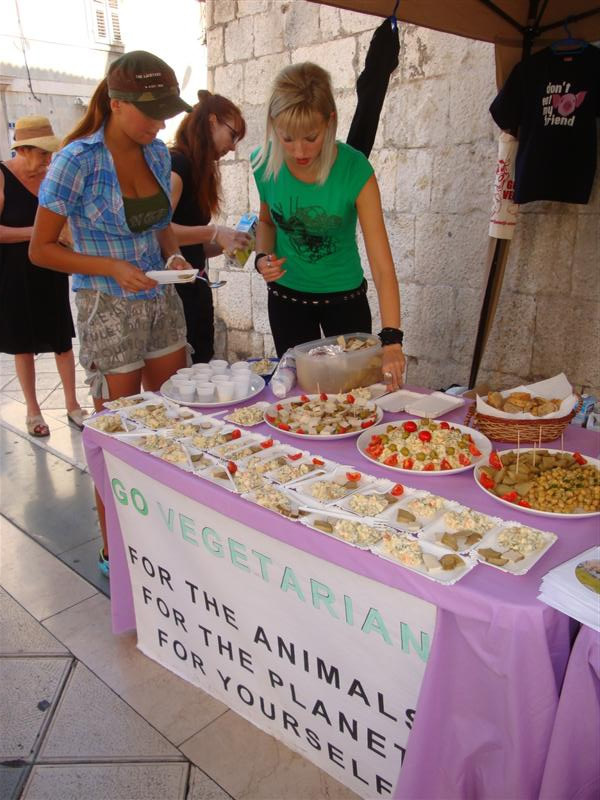 - In Zagreb and Split: tastings of vegan dishes, projection of the film "Meat Eats People," promotion of the cookbook "Mljac"
To mark World Vegetarian Day, on October 1, Animal Friends is launching the Veggie Challenge and invites the public, until the beginning of ZeGeVege Festival from October 14-15, to become vegetarians or even better, vegans. That is how they'll gain unique opportunity to try benefits of a plant-based diet for animals, environment and their own health! The goal of the Veggie Challenge is to demistify vegetarian diet and to bring ethical, health and ecological values closer to the vegetarian way of living and to show how delicious and healthy food comes with ingredients of plant origin. Daily, with own decisions, choices and activities we affect the world we live in. The success of the Veggie Challenge will be measured by that. All interested to participate in the Veggie Challenge can apply by registering on website www.prijatelji-zivotinja.hr or at the Animal Friends' stalls. 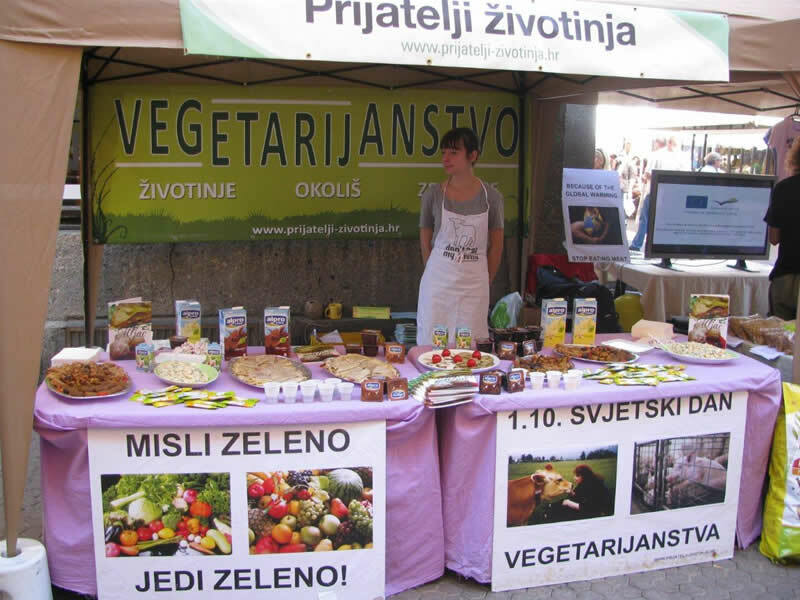 At the stalls on Saturday, October 1, in Varsavska ulica near Trg Petra Preradovica in Zagreb, the citizens can apply for the Veggie Challenge and leaf through and buy the newly published cookbook for real gourmands "Mljac." They will also be able to see a projection of a short new video "Meat Eats People" and at 12 noon they will be able to taste a variety of vegan dishes of tempting taste and smell of meatballs, pancakes, etc. 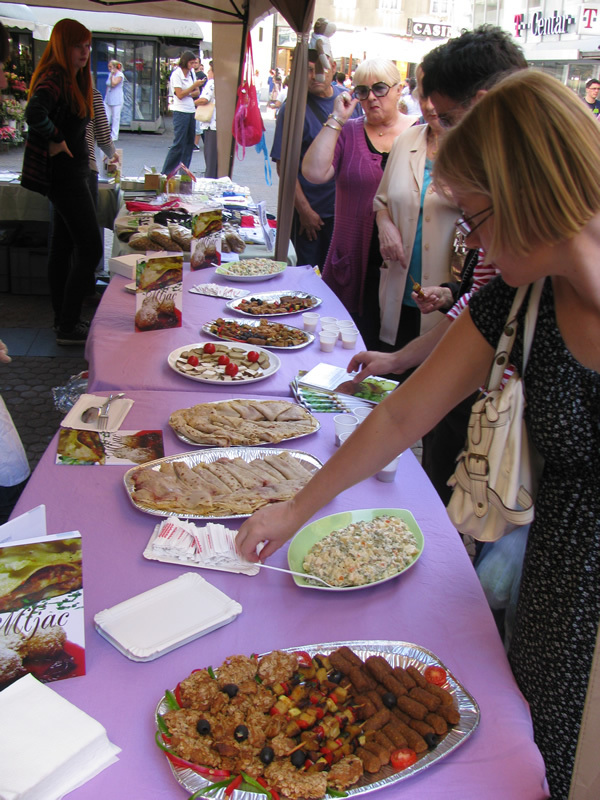 Similar event with tasting of delicious dishes will be held at the same time in Marmontova ulica in Split. This year, the 4th ZeGeVege Festival of Sustainable Living will be held on October 14 and 15 on Trg bana Jelacica in Zagreb. The festival is being held on the occasion of the tenth anniversary of Animal Friends, the organizers of this unique festival, where this year also, with big number of exhibitors and whole-day program on the stage, there will be various interesting, educational and fun contents – free make-up, promotional sale, ecological innovations etc. With various tastings, a vegan restaurant will offer affordable healthy meals. For majority of registered people for the Veggie Challenge, ZeGeVege Festival will not be the end of their veggie challenge but a decision day for a permanent change in their diet and switching to ethical, ecological and healthier life orientation. With that decision, challenge is continued through whole life, through gourmet discoveries and through new knowledge on benefits of veg(etari)an diet. To those who decide not to replace the Veggie Challenge with veg(etari)an lifestyle, a new useful experience will remain that will enable easier switch to non-meat diet in the future, which is practiced by 150,000 citizens of Croatia. All participants of the Veggie Challenge should expect awards, and on Animal Friends website delicious veggie recipes will be posted during the Veggie Challenge. That way World Vegetarian Day can become the beginning of new, healthy and ethical choices which bring long term positive changes for every individual and the whole world. More information about the Veggie Challenge and advantages of vegetarianism and sustainable lifestyle can be found at www.prijatelji-zivotinja.hr, www.zegevege.com and www.vegan.hr. The film "Meat Eats People" can be seen on www.youtube.com/afcroatia. All media representatives interested in presenting cookbook "Mljac" can get a copy of the book. Gifts for viewers/listeners/readers are also provided. Sponsors of the tasting are Alpro soya, Omegol, Prasadam, and Makrovega. The creator of idea and initiator of the Veggie Challenge is company Lush which does not test its products on animals.